Harnesses the restorative powers of the ocean to care for every skincare needs. Featuring antioxidant-rich Corallina Officinalis (Coral Seaweed) and the healing properties of marine botanicals, we bring you exceptional products infused with the revitalizing potential of the deep sea. 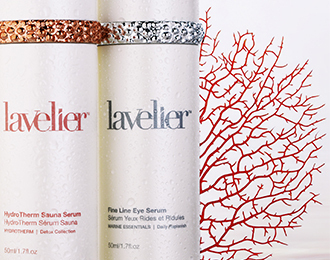 Lavelier’s key ingredient, Corallina Officinalis (Coral Seaweed), is a red seaweed harvested from the deep ocean. It contains high micro-nutrient concentrations, rich bioactive compounds, antioxidant and anti-inflammatory properties, and trace minerals including calcium, magnesium, manganese, zinc, amino acids, and vitamins. Thanks to its anti-photoaging compound, phlorotannin, Coral Seaweed has also been shown to slow down the degradation of skin collagen by preventing UV-induced oxidative stress, thereby preempting the pigmentation process and the wrinkle-causing effects of UV rays.